Over the last couple of years, one sport has been spreading rapidly in the United States — pickleball. The U.S. Pickleball Association calls the game the fastest growing sport in North America. 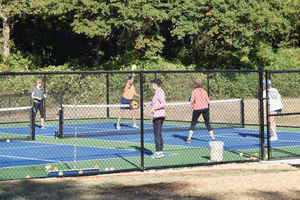 That growth trend was recently recognized by the city of Auburn, which opened two new regulation pickleball courts last week. The new outdoor courts are located next to the Frank Brown Recreational Center, where a shuffleboard court was also built. While many still don't know what pickleball is, they usually remember it by its peculiar name. "The guy who developed it, his dog was Pickle," said Debbie Rusk, Auburn resident and pickleball player. "It's hard to tell what it is when you hear the name, but the guy who made it named it after his dog."